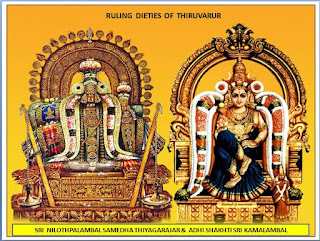 The historic name of Thiruvarur was Aaroor (Arur) and it finds mention in the 7th century saiva canonical work, Thevaram.The term Thiru is added to all temple cities that are mostly revered by the verses of Thevaram, which is the case of Arur becoming Thiruvarur. 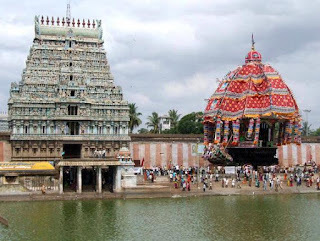 Another name of Thiruvarur is Kamalayaksetra, meaning the "holy place that is an abode of lotuses"; the town is also referred so due to the presence of the Kamalayayam tank and the temple deity, Kamalambigai. The temple is huge in size and importance, with 9 Rajagopuras, 80 Vimanas,13 mandaps, 15 wells of Theertha importance,3 prakaras, 365 Shiva Lingas representing the days of the year, shrines numbering above 100, 86 Vinayaka idols and temples within the temple numbering above 24. The temple complex covers 30 acres which is one of the largest in India. It houses four gateway towers known as gopurams. The tallest is the eastern tower with four stories and a height of 30 meters (98 ft). The temple has numerous shrines, with those of Thyagaragar (Veethi Vidangar) and Neelothbalambal (Alliyankothai) being the most prominent. An inscription which was dated in the 20th year of the Rajendra CholaI (1012–1044) beginning with the introduction "Thirumanni valara" is found on the north and west walls of the Thyagaraja shrine.There is a list of gifts including a number of jewels and lamps to Lord Vidividanka Devar (Thygarajar). The temple was built in stone in the regional years of the King by Anukkiyar Paravai Nangaiyar. The temple complex seems to have acted as the cultural model for the Big Brahadeeswarar Temple at Thanjavur built by Emperor Rajaraja Chola I, wherein he enshrined a Vidankar which shared with the Atalvallan of Chidambaram the status of state cult. The last Chola monarch to play an important role in the affairs of the temple was Kulothunga Chola III in the early part of the 13th century A.D. It attracted saivaites of all schools and was important centre of Golaki math in the 13th and 14th century. The temple complex has a numerous shrines and mandapas (Halls) in the three spacious enclosures.The two main shrines of the temple are for Sri Vanmikinathar (Lord Shiva) and Sri Thyagarajar. Of the two, the former is the most ancient, and derives its name from tea anthill (putru), which takes the place of Linga in the main shrine. All the Navagrahams face south in a straight line in the northwest corner of 1st (prakaram). The other shrines in this temple are Sri Aananthiswarar, Sri Neelothmbal, Sri Asaleswarar, Sri Adageswarar, Sri Varuneswarar, Sri Annamalieswarar and Sri Kamalambal. The temple has a lot of halls, with six of them being the most prominent. Bhaktha Katchi hall is located to the left of the image of Musukuntha Nandi (Nanhi will be standing for honoring the King). The festival image of Thyagaraja arrives at this hall after the Panguni Uthiram festival. Oonjal hall is located opposite to the Kabatha Katchi hall. The festival images of Chandrasekarar and Sekari Amman arrive at this hall during the Thiruvadhirai festival. Thulapara hall is named after the legend in which King Musukuntha placed Thyagaraja image of Thiruvarur in one and all others in another plate he received from Indra (the King of celestial deities). Purana hall is located in the northern part of the temple. Rajanarayana hall is a public hall for localities of Thiruvarur. Sayaraksha deeparathana is special at Thiruvarur. It is believed that Indra himself performs it here daily. All vadhyams will are performed from the outer praharam along with neivedhyam and brought inside. Deeparadhana and other upacharas are done towards the top of the vimanam of Thyagaraja. The Ambal sannidhi complex has a lot of mysticism built into it with the figures and construction all as per Srividya concept and it will not be explained.by the priests to all. For example the Ganapathy in the main temple entrance is called Vallabha Ganapathy due to Vallabha on his left lap with the lord having 10 arms also. The Ambal sanidhi has an Uchishta Ganapathy with an asura neela on his lap who becomes a Goddess as Ganapathy is with her. These are all part of the Srividya worship traditions hence a treat to the connoisseur. The temple is famous for the ajapa natanam that is executed by the deity itself. According to the legends, the Chola king named Musukuntha obtained a boon from Indra and wished to receive an image of Thyagaraja Swamy reposing on the chest of the reclining Lord Vishnu. God Indra tried to misguide the King and had six other images made, but the king chose the right image at Thiruvarur. The other six images were installed in Thirukkuvalai, Nagapattinam, Thirukarayil, Thirukolili, Thirukkuvalai and Thirumaraikadu. Those worshipping the Face Darshan of Lord Thiagaraja in Thiruvarur are advised to have His Feet darshan (Pada darshan) in Vilamal, 3 km far from this place. Lord Vishnu's worship of Somaskanda forms the core of the belief systems surrounding the Ajapaa Natanam. It is believed that Vishnu fashioned an image ofSomaskanda and wore the image on his chest and meditated upon it in silence. The meditative silence of the un-uttered prayer (A - Japaa), accompanied by the graceful movement in both the vertical and the horizontal planes of the Somaskanda image, in synchronization with Vishnu's meditative breath is considered to be the root of the mystical AjapaaNatanam. The Ajapa dance of Thyagaraja signifies the control and manuovere of breathing. The Tevaram hymns of Thirunaavukkarasar refer to this association between the meditative breath of Vishnu and the dance of Somaskanda. Thirumoolar's Tirumantiram speaks of the significance of the unchanted Ajapa and its association with the dance of Shiva (Thirukkoothu). The Somaskanda or Thyagaraja shrine at Thiruvarur is thus associated with the Ajapaa dance. This dance is enacted everytime the deity is taken out in procession (as in Maargazhi Thiruvadirai and Panguni Utthiram) - using a contraption held in place with the bark of the plantain tree. It is to be noted that each of the 7 Saptavitanka temples is associated with a certain type of dance that is enacted on festive occasions and that the Tyagaraja shrines in the non-Vitanka stalams such as Thiruvotriyur and Thiruvanmyur also feature a form of dance specific to the temple. (Shown above is an image of the enactment of the 18 Natanam at Thiruvanmyur). It is also to be noted that the art of classical dance has a special place in the traditions of the Thiruvarur temple. A large number of dancers were associated (dedicated to the) with this temple during the reign of the Imperial Cholas as seen from temple inscriptions in the Chola region. Dance has been an integral part of the temple worship services although it does not enjoy the same status now as it did owing to societal changes. Instead, a distinct pause in the midst of the worship rituals signifies the original status of this performing art in this ancient monument. The annual chariot festival of the Thygarajaswamy temple is celebrated during May - June, corresponding to the Tamil month of Vaikasi. The chariot is the largest of its kind in Asia and India weighing 300 tonne with a height of 90 feet. The chariot comes around the four main streets surrounding the temple during the festival. Thiruvarur is home to Trinity of Carnatic music, namely Thyagaraja (1767–1847 CE), Muthuswamy Dikshitar (1775–1835 CE) and Shyama Shastri (1762–1827 CE). Muthuswamy Dikshitar has sung eulogies of deities here.